May is New Zealand Music Month (NZMM) and to help celebrate the Heritage & Research teams at the Central Library have compiled a playlist featuring some of our favourite New Zealand songs. The only proviso for selection was that we had to hold it in our Heritage collections. 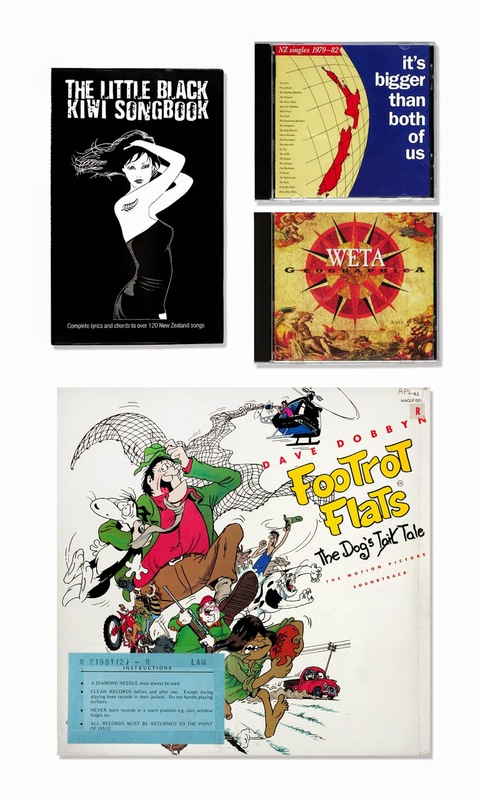 Format wasn’t specified as you can see from the images below; we have LPs, CDs, film soundtracks and a couple of songbooks. 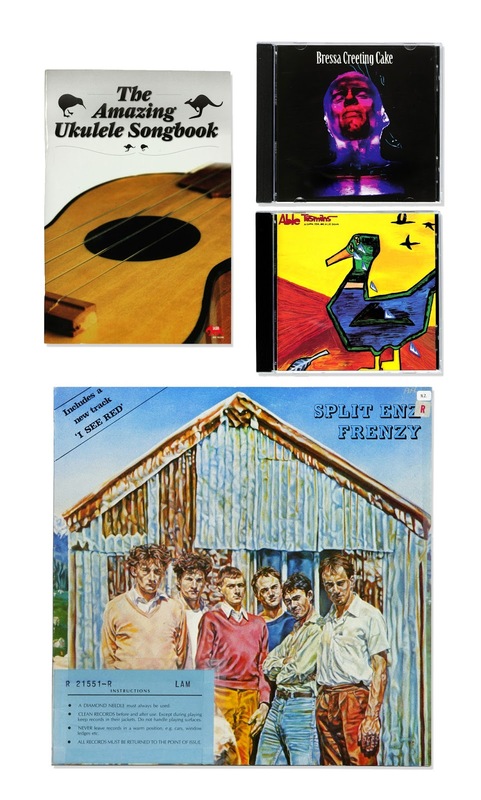 Ref: Items from Sir George Grey Special Collections, clockwise from top left: The amazing ukulele songbook, Bressa Creeting Cake (self-titled) CD, Able Tasmans 'A cuppa tea and a lie down' CD, Split Enz 'Frenzy' LP. This post was inspired by (blatantly stolen from) a blog post written by Sholto Duncan at the Turnbull Library a few years ago, which also featured a mixtape to celebrate NZMM. Although it may seem strange to be providing streaming playlists for these songs when the ones we hold are in a variety of other formats, it does raise a nice point about the ephemerality of digital music. Not so much the digital versions of the songs themselves, but the methods of accessing them. I’ve chosen YouTube and Spotify to play them today, but who knows if they’ll work when the next music month comes around? What about NZMM in 2025? Will Tidal, Pandora and Apple’s Beats music go the way of Audiogalaxy and Grooveshark? What will still be here in 2025 are the CDs, LPs and cassettes in our heritage collections and the equipment required to listen to them. So if you’d like to listen to any of the songs we’ve chosen today, or have a look at the album art, do come into our reading room. 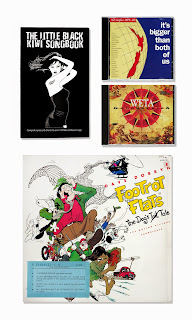 Ref: Items from Sir George Grey Special Collections, clockwise from top left: The little black Kiwi songbook, 'It's bigger than both of us: NZ singles 1979-82' CD, Weta 'Geographica' CD, Dave Dobbyn 'Footrot Flats: soundtrack' LP. Zoë provided a more in depth look at our heritage music collections for NZMM last year, and do browse music related posts on the blog, they range from God Defend New Zealand through to night clubs and dance halls of the 1950s and 1960s. For a more on the history of pop music in New Zealand have a look at Audio Culture and the Rip it up tumblr page, which is a project attempting to digitise every issue of Rip it up magazine. If you’d like to read issues that aren’t yet up online, come into the Central Library as we’ve a complete run of Rip it up in our collections. Also be sure to check out Auckland Libraries dedicated music blog, All things musical, for more NZMM content throughout the month including playlists to suit all tastes. For other NZMM events on around the region see the Auckland Libraries website.